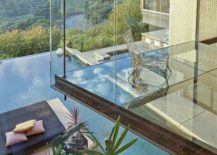 Ever walked on one of those glass bridges at the mall or stepped atop a seemingly precarious stairway with floating glass stairs? 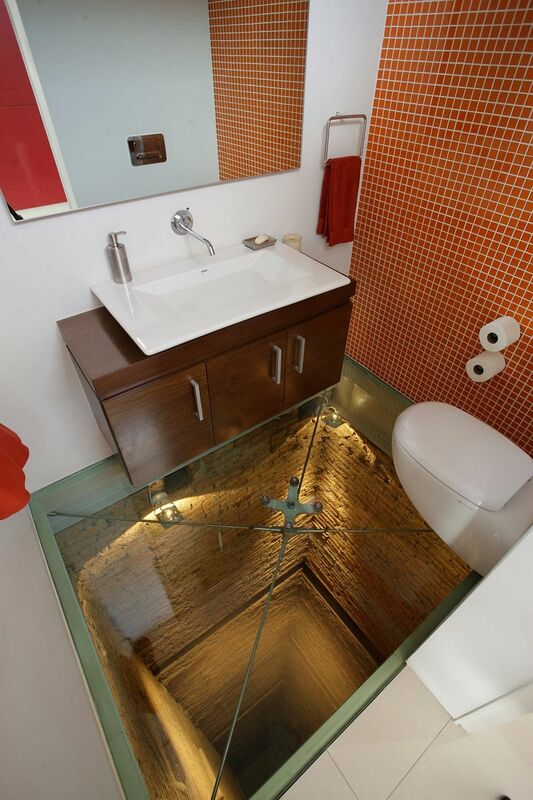 If you have, then you will know that this is not a thing for the faint of heart! 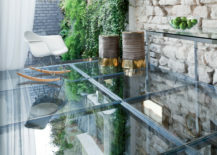 Glass floors instantly draw attention, move away from the mundane and give your home a dramatic, contemporary twist. 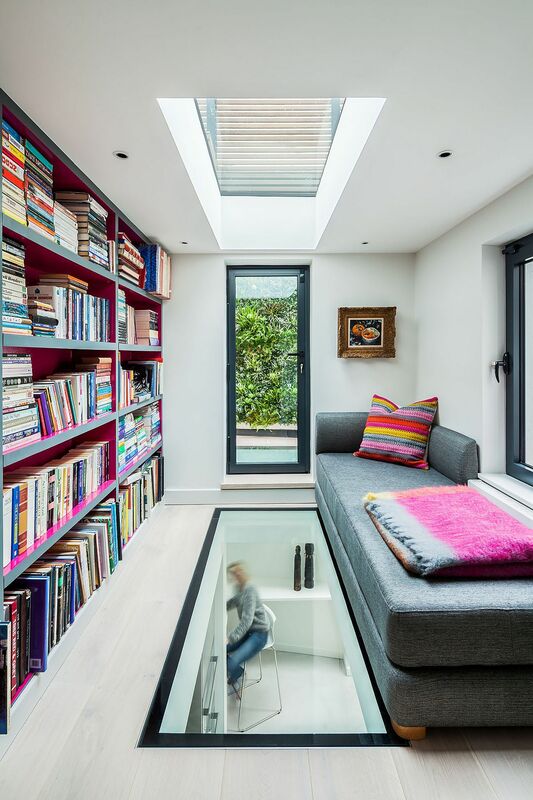 They are not easiest to pull off or even maintain, but a glass floor can make a huge visual and aesthetic impact without trying too hard. 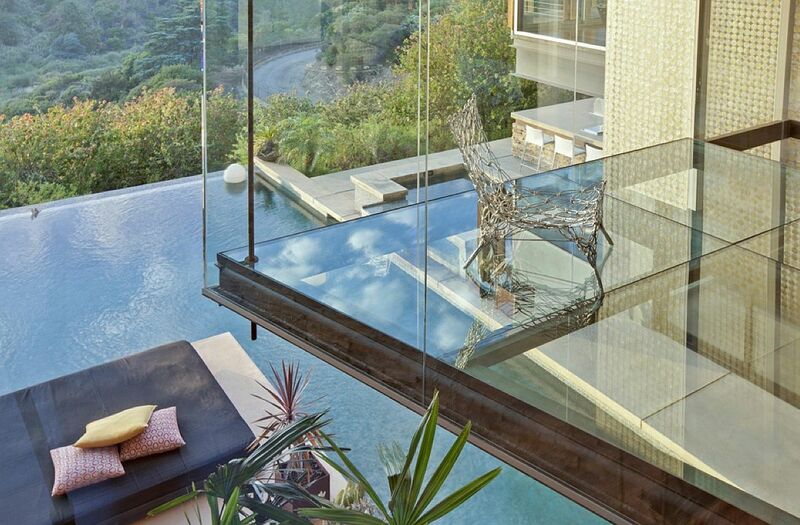 And undoubtedly, it is the transparent ones that feel most exciting! 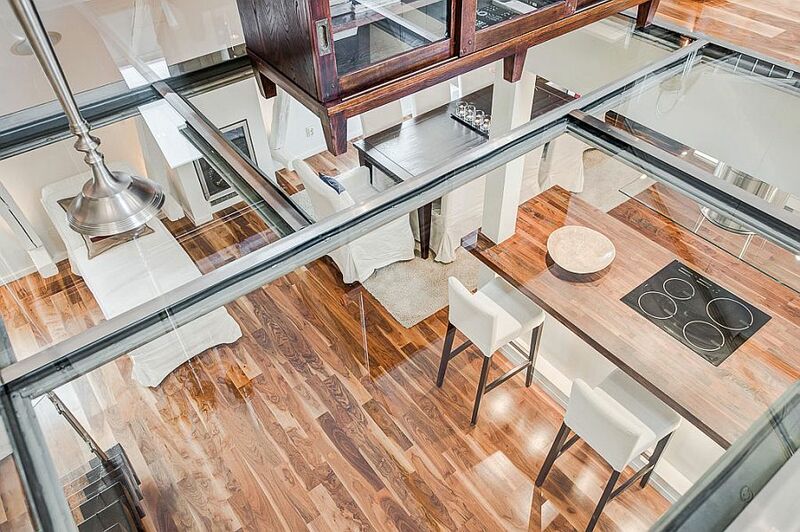 The perception that glass floors are inherently brittle is misplaces. 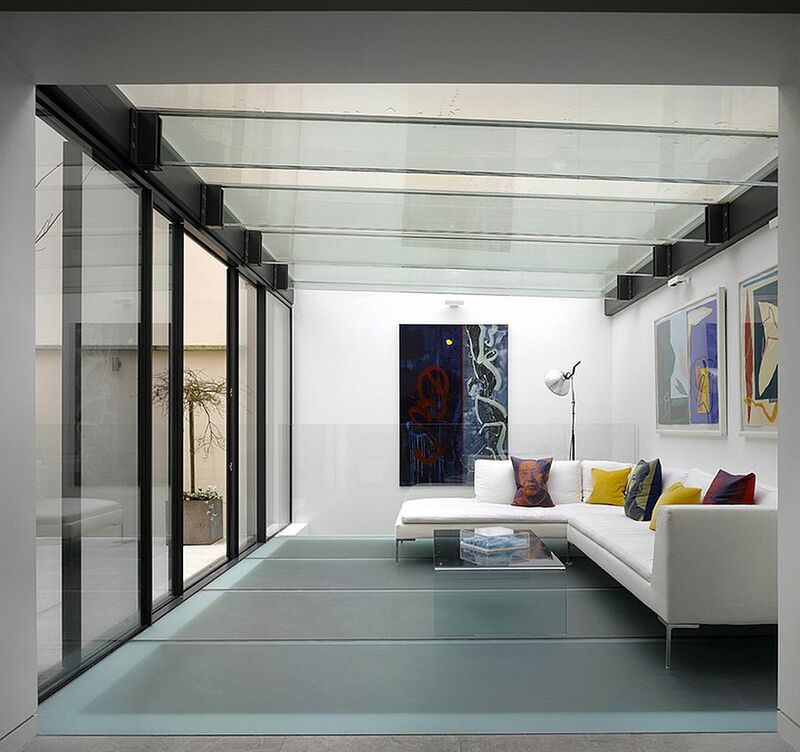 It all depends on the type of glass and with walkable skylights and tough glass surfaces that are scratch-free; it is barely a surprise that homeowners today are more willing to try them out than ever before. 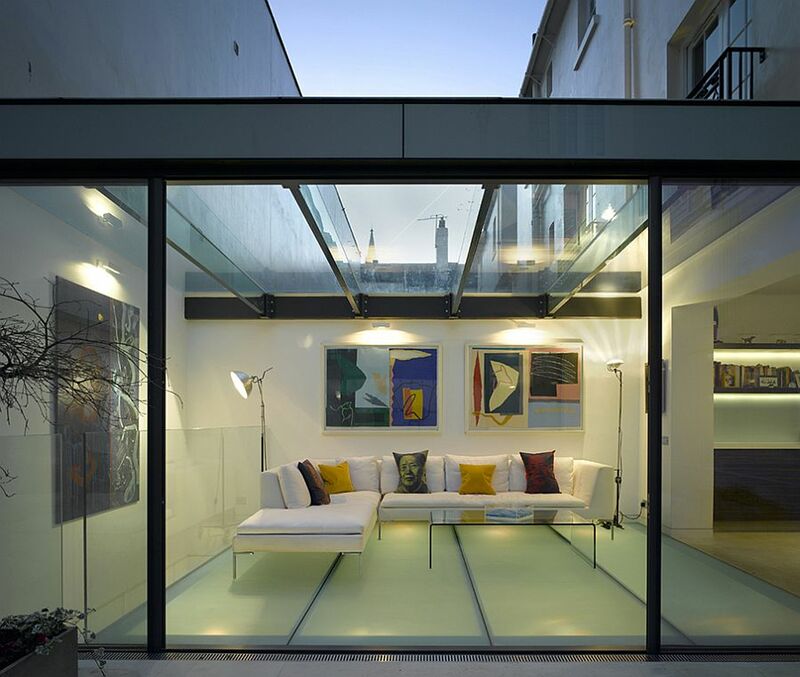 If the transparent glass floor seems like an infringement of privacy, you can even consider translucent variants. 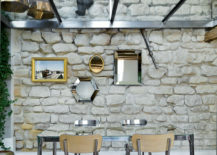 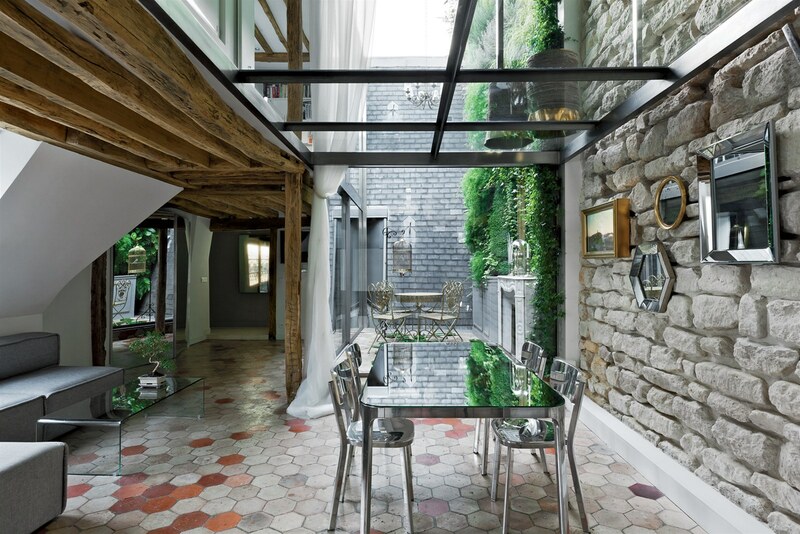 Fabulous, sparkling and truly special, here are the best inspirations to get you started! 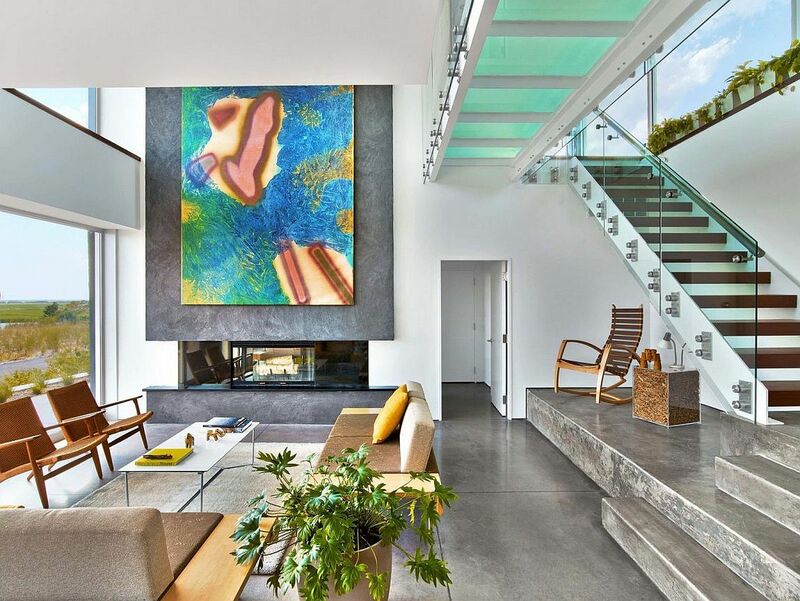 Most often architects turn to glass floors when they need to give an interior a more breezy and light-filled ambiance without having to alter too much. 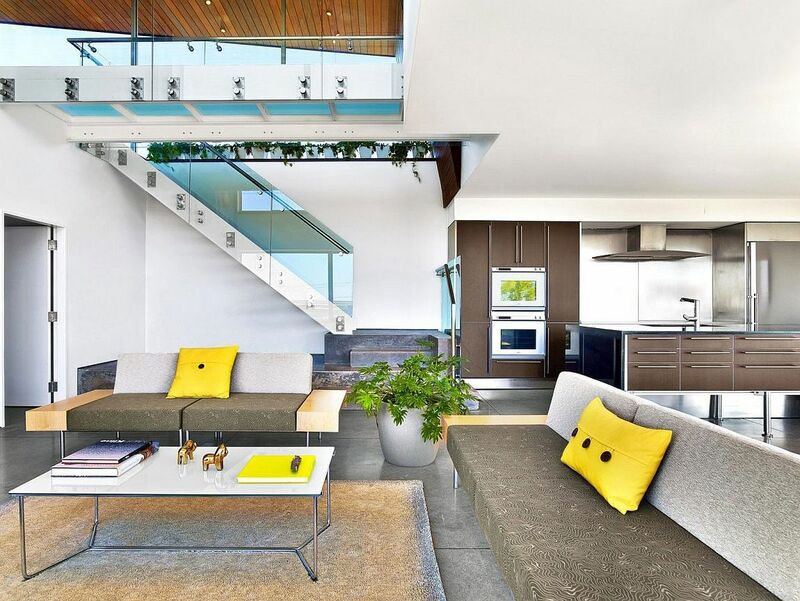 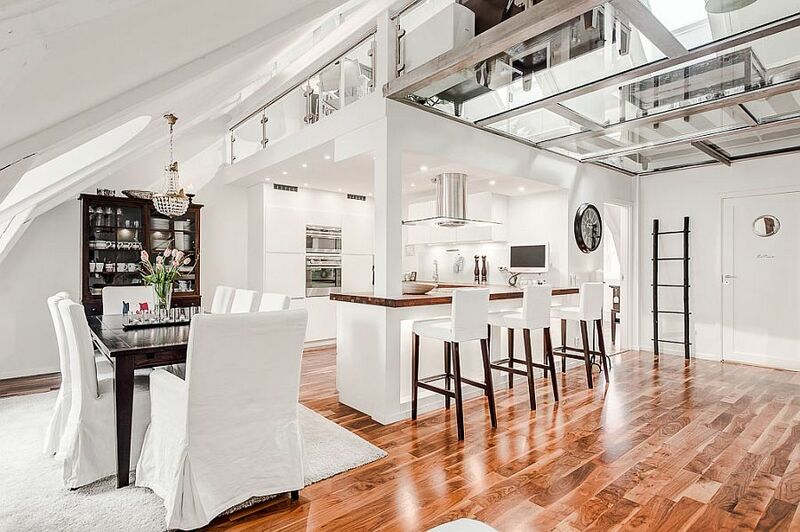 This stylish apartment with modern Scandinavian style uses the glass floor in an extensive and exquisite fashion to ensure that the lower level of the home feel as cheerful as the top bedroom floor. 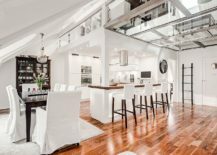 The glass floor next to the bedroom brings light into living area and kitchen below even while enhancing the refined vibe of the interior. 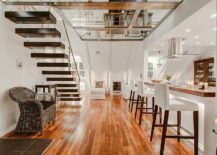 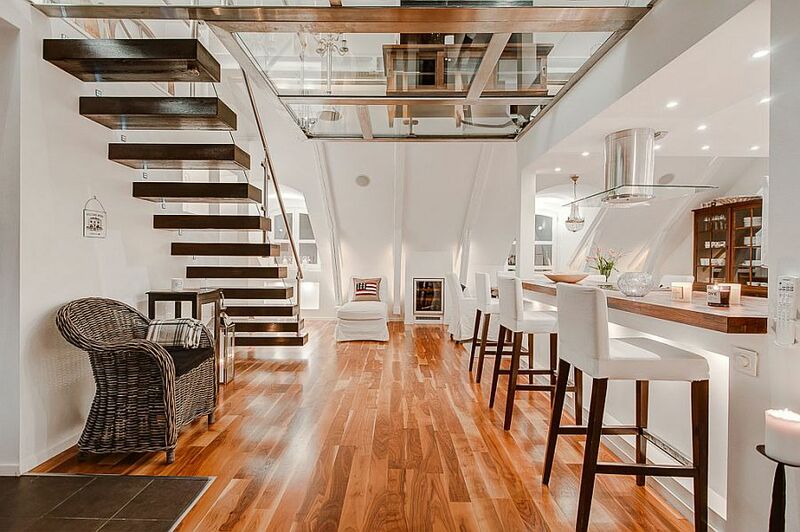 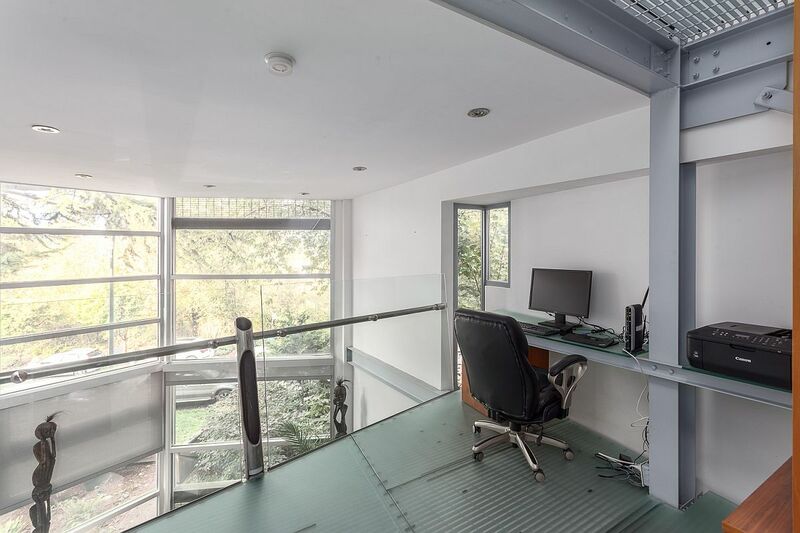 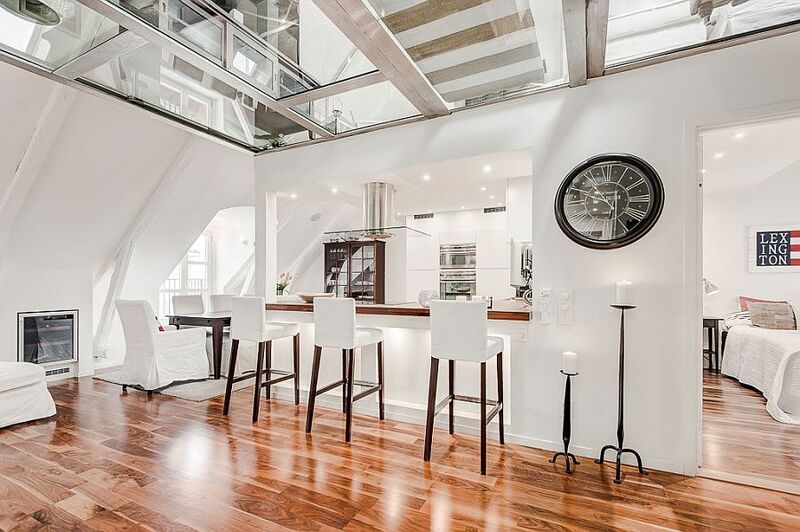 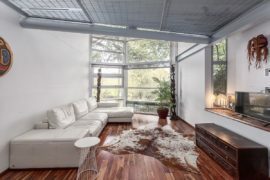 Glass floors are not just for contemporary homes and this renovated duplex is a perfect case in the point. 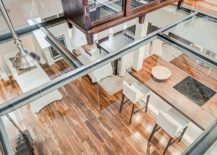 Instead of opting for the mundane design solutions, these homeowners took the dramatic route and coupled classic materials like stone and wood with a stunning glass floor. 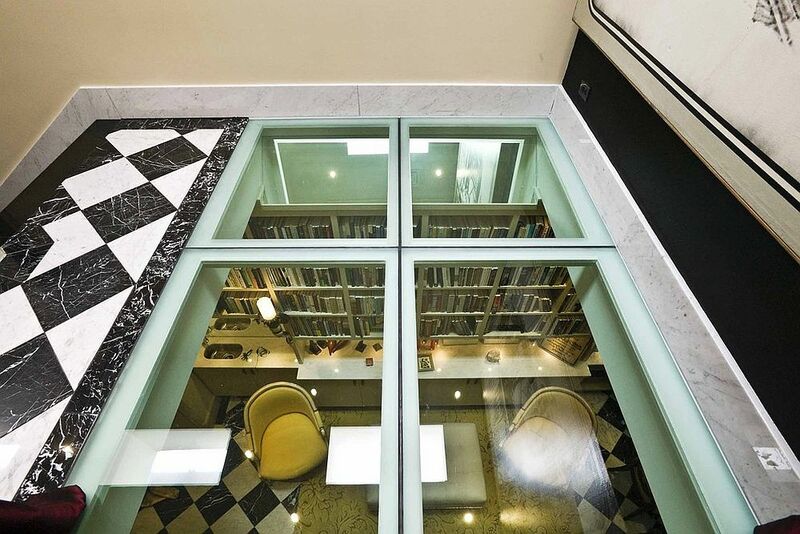 Acting as the ceiling for the new dining area, the glass floor is much more than eye-candy as it shapes a unique and delightful study space on the top level. 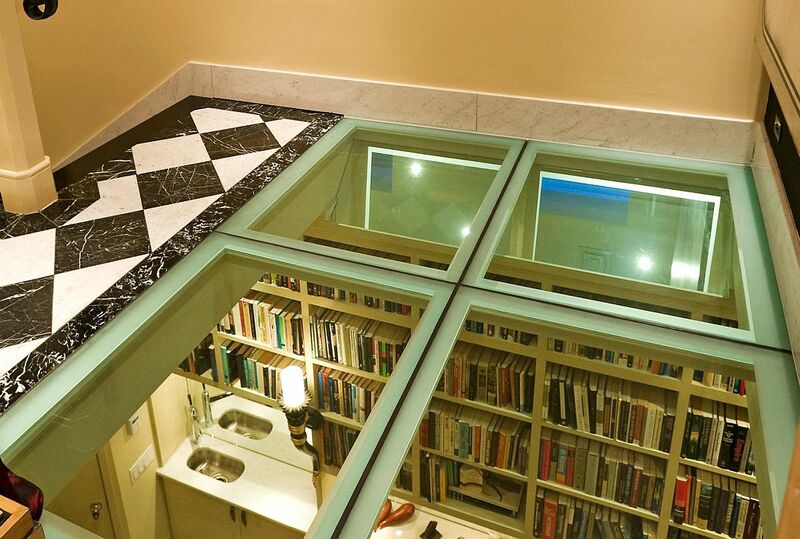 A walk on the sensational glass floor! 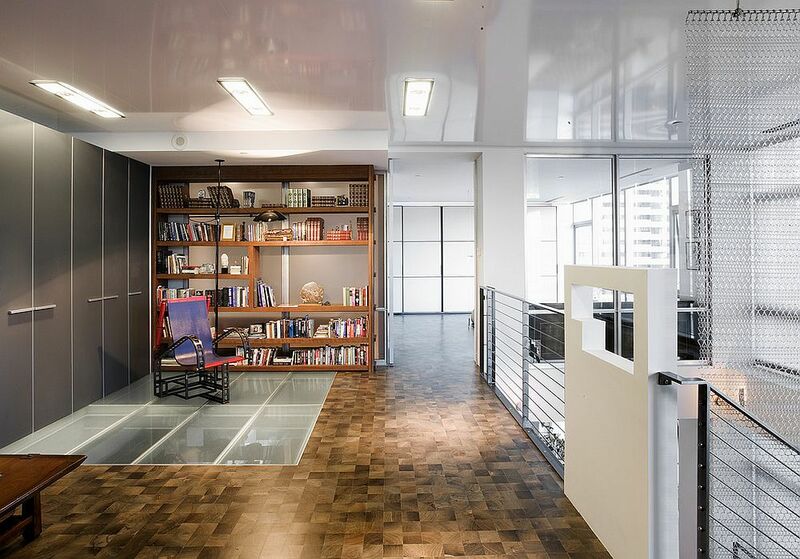 If an extensive glass floor seems like too much of a hassle, then how about giving the glass walkway a shot! 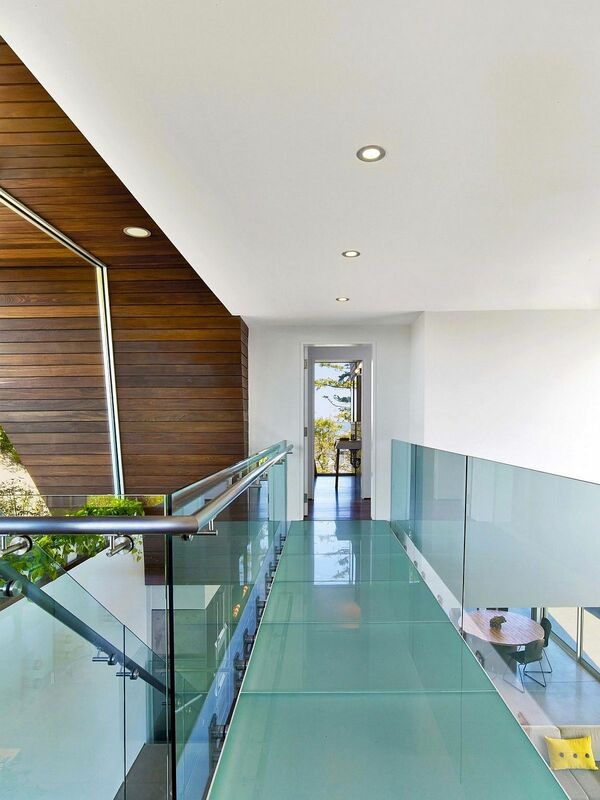 A smart bridge in translucent glass connecting two different wings of your home is a great addition that instantly improves the charm of the interior. 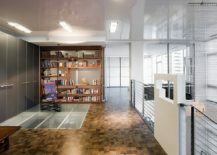 Do not believe us? 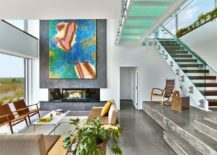 Check out this Cape Cod Beach House and you will be convinced! 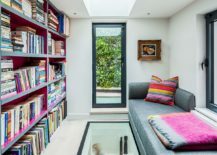 When it comes to glass floors, finding out what works best for your home is the right way forward. 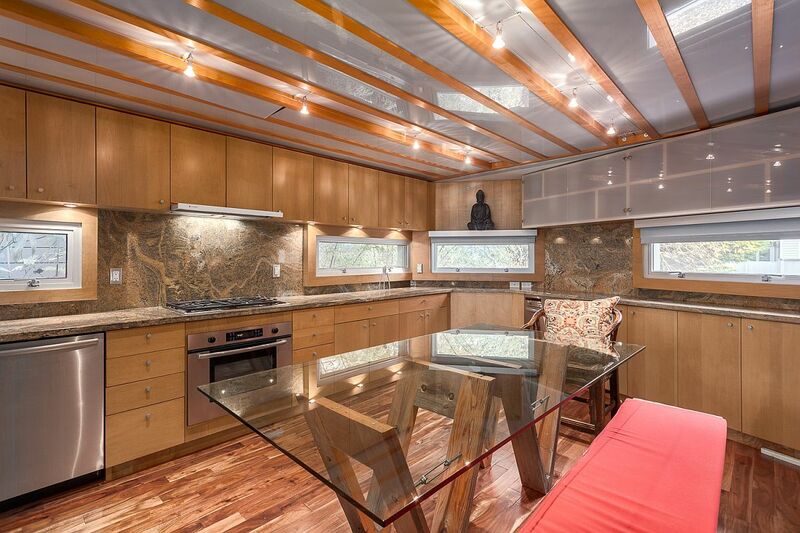 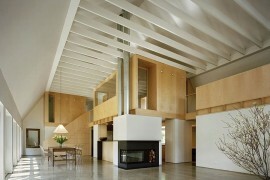 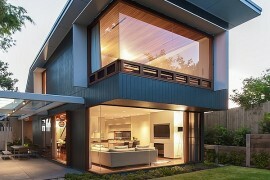 An extravagant design solution that appears breathtaking might just not work on a practicality scale. 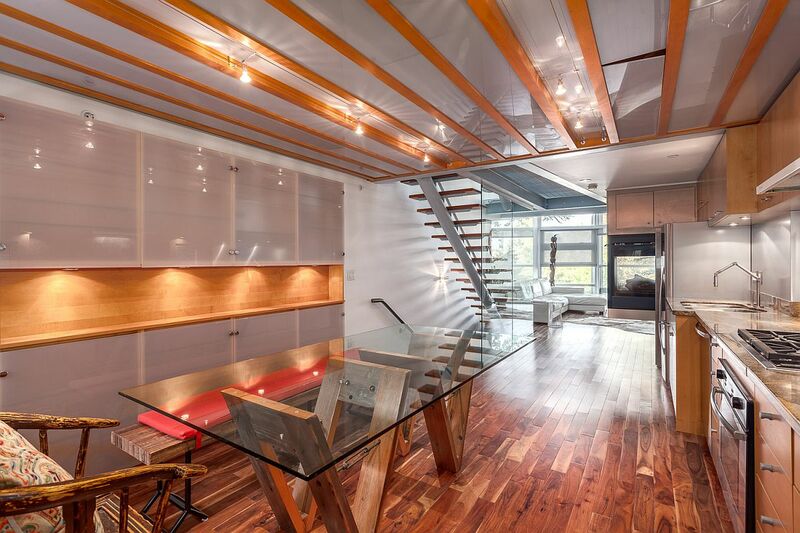 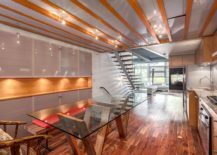 This Vancouver duplex places emphasis on ergonomics as it uses strips of wood and translucent glass to create a unique floor for the top level study and bedroom. 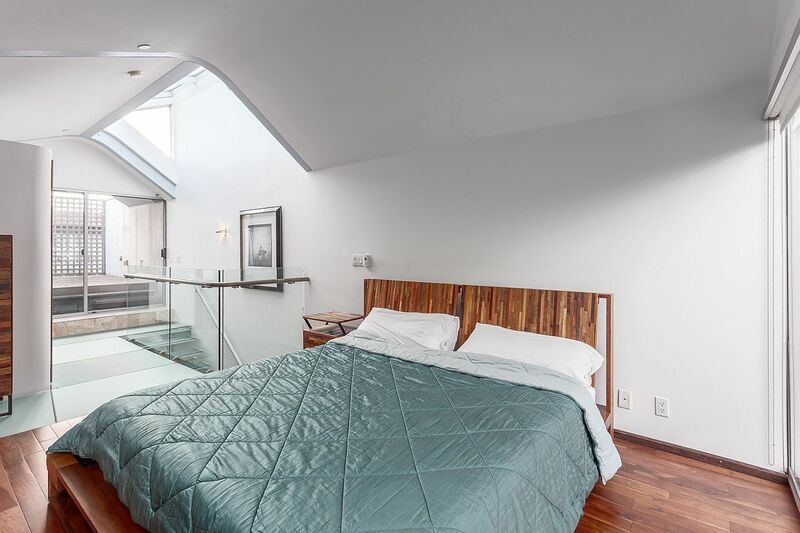 The home library / guest room with the living room below is a wonderful place to try out that tough skylight which is built to take traffic. 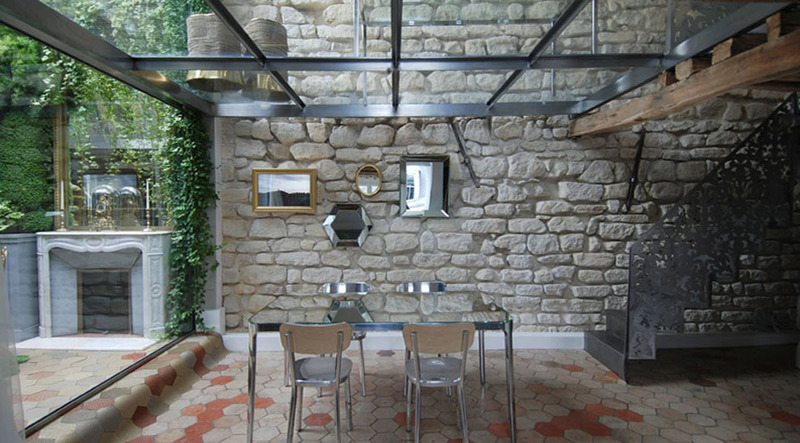 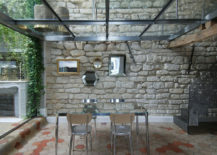 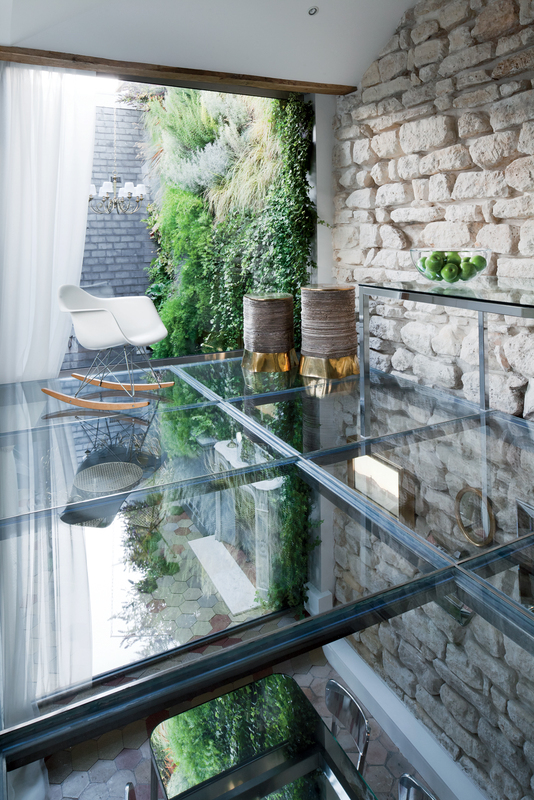 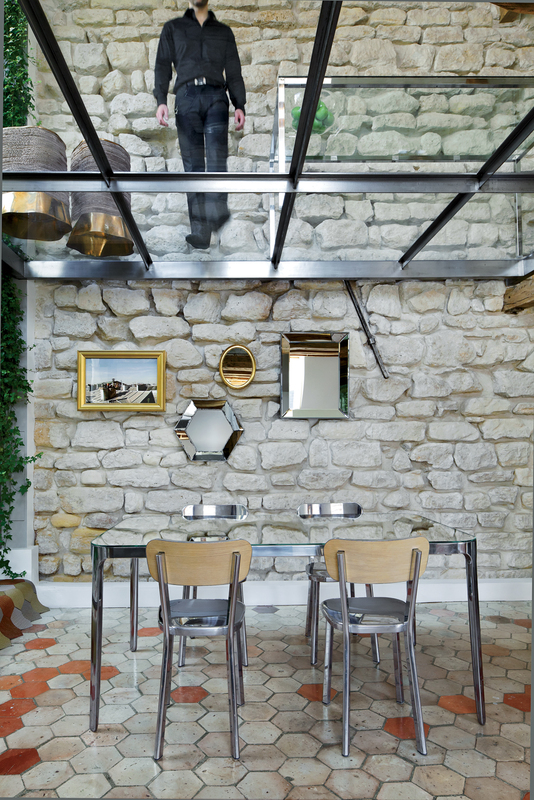 This is a feature that doubles as a glass floor section and also serves the living or dining space below elegantly. 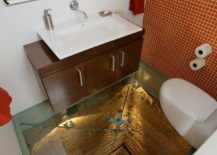 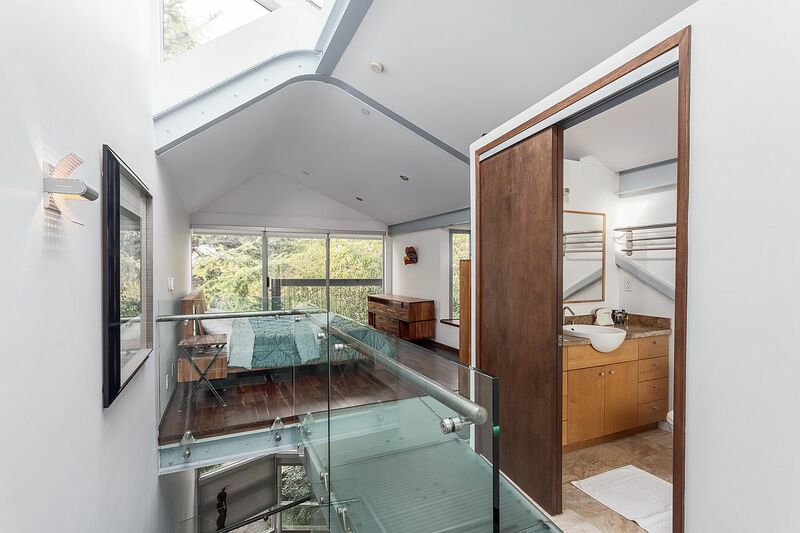 Of course, those on the lookout for something even more astounding can check out the jaw-dropping bathroom with glass floor that was previously a 15-floor elevator shaft. 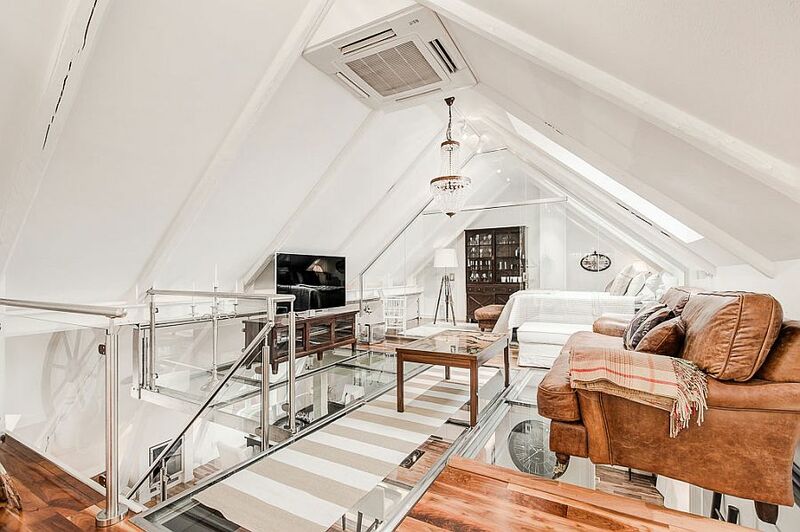 And if you want star-studded inspiration, then the glass floor bedroom of Justin Bieber should do the trick!